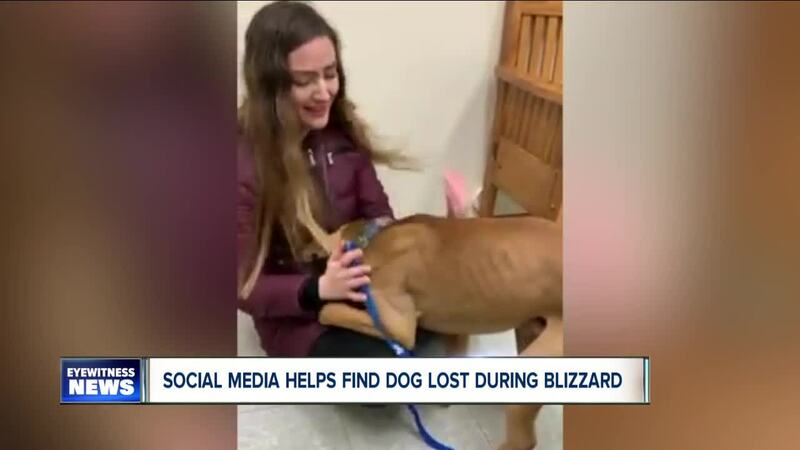 NORTH TONAWANDA, N.Y. (WKBW) — Stephanie Lyon from North Tonawanda has now been reunited with her lost dog named "Franklin." The one-year-old pit bull slipped outside on Monday January 28th and was not seen again for over eight (8) days, during which time the area was hit by a blizzard and sub-zero temperatures. Lyon said she went to shelters and put out flyers asking if anyone had found the dog. Lyon's co-workers at the Colvin location of the BAC for Women got things started by putting out simple online posts which quickly spread. "On the one post, I had over 3,000 shares and I never expected it to reach anyone," added Lyon. "There were lots of tips, leads and comments on Facebook pages. We followed up on every one of them," said North Tonawanda Dog Control Officer Eric Salisbury. North Tonawanda Police and Dog Control Officer Salisbury finally located Franklin after a phone call advising them an animal was hiding under a dump truck in a storage yard for S&S Tree Service near Witmer & River Roads. Salisbury said North Tonawanda Police were just as committed to finding the lost dog during the bad weather as he was. Franklin lost over 20 pounds from his frigid-weather experience but is expected to recover without any long-term injuries, explained Lyon. "The message I want to get out is to never give up when you have a lost pet," said Stephanie Lyon, who spoke with 7 Eyewitness News Reporter Ed Reilly. Lyon advises pet owners with a missing animal to take all steps they can to find their pet, such as, visiting animal shelters, handing out flyers and using social media to get "more eyes" in the search. You can see pictures of Stephanie's reunion with Franklin in the attached video clip.